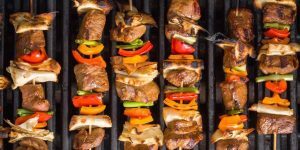 While some think of grilling as a leisurely weekend activity, firing up the grill during the week is a great way to break out of the normal dinner routine. These recipes for weeknight grilling are a no-fuss option when it’s too hot – or too nice! – to cook inside. Just remember to adjust your cooking times according to whether you have a gas or charcoal grill, and enjoy! These delicious and flavorful steak fajita skewers from Delish.com are as easy as can be, and cook in less time than it takes to prep. 2. Skewer steak, scallions, tortillas (folded), and peppers. Drizzle with olive oil and season with salt and pepper. 3. Grill, turning occasionally, until steak is medium rare and vegetables tender and slightly charred, about 7 minutes. This Betty Crocker recipe for grilled summer veggies is easy to prepare and great for using up any produce or veggies laying around in your fridge. Feel free to add in your family’s favorite herbs and seasonings! 1. Heat gas or charcoal grill. 2. In large bowl, stir together all ingredients. Cut 24-inch-long sheet of heavy-duty foil. Onto center of foil, pour vegetable mixture. Bring up 2 sides of foil so edges meet. 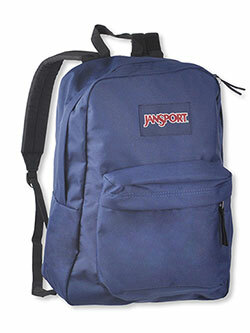 Seal edges, making tight 1/2-inch fold; fold again, allowing space for heat circulation and expansion. Fold other sides to seal. 3. Place foil packet on grill over medium heat. Cook about 25 minutes, turning once, until potatoes are tender. 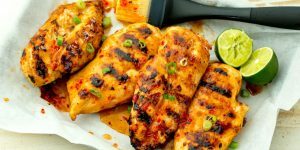 When you’re tired of the same old barbecue chicken, this sweet and tangy variation from Delish.com is a great alternative. Try to let it marinade for at least a few hours beforehand, or overnight if you can. 1. Make the marinade by whisking together sweet chili sauce, lime juice and soy sauce. Reserve 1/2 cup marinade for basting chicken after grilling. 2. Add chicken to a large Ziploc bag or baking dish and pour over marinade. Let marinate in the refrigerator at least 3 hours, or up to overnight. 3. When ready to grill, heat grill to high. Oil grates and add chicken, then baste with marinade and grill until charred, 8 minutes per side. 4. Baste with reserved marinade and garnish with green onions. Serve with lime wedges. 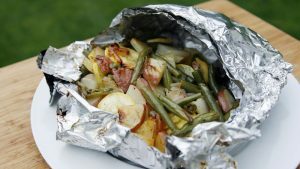 Foil packs are the secret to quick and easy grilling. This Delish.com recipe gives regular sausage and peppers a wonderful smoky flavor. 1. Heat grill to high. Cut 4 sheets of foil about 12″ long. 2. Grill sausages until charred, 3 minutes per side, then divide among foil. Top with peppers and onions and drizzle each with 1 tablespoon olive oil, then season with salt and pepper. 3. 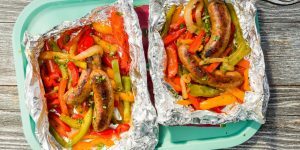 Fold foil packets crosswise over the sausage and peppers mixture to completely cover the food. Roll top and bottom edges to seal closed. 4. Grill until peppers and onions are tender and sausage is cooked, 13 to 15 minutes.